Greek, Etruscan, & Roman Bronzes (MFA), no. 357; Sculpture in Stone and Bronze (MFA), p. 122 (additional published references). 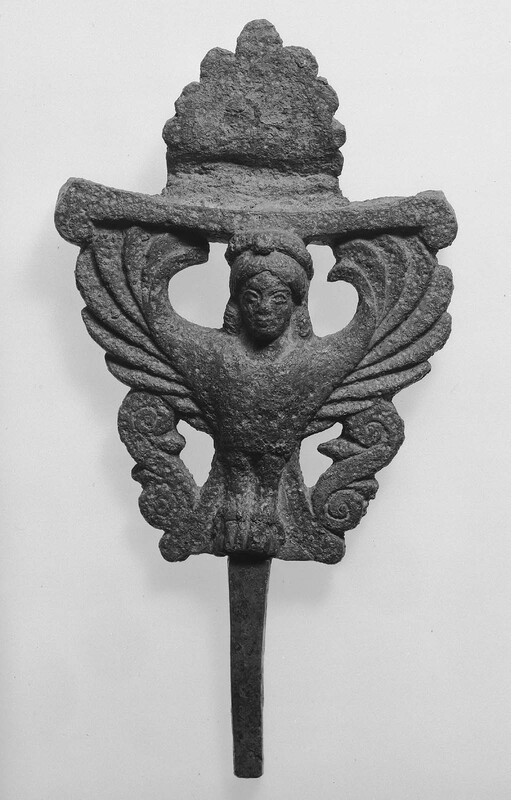 A Siren with wings outspread stands amid supporting volutes at the upper part of the mirror handle. The back of the handle, where it joined the mirror, is in the form of a palmette. The late archaic face of the Siren is molded in a good Sikyonian or Corinthian style. The tang for insertion in the handle proper (wood or bone) is smooth. Much corroded. Green patina.